Baha’is believe in peace, justice, love, altruism and unity. The Baha’i teachings promote the agreement of science and religion, the equality of the sexes and the elimination of all prejudice and racism. Just about anywhere you go on the planet, you’ll find Baha’is—the Baha’i Faith is the world’s second-most widespread religion after Christianity, spanning the globe and working to unite it. Baha’is have no clergy or churches, gathering together in democratically-led communities and welcoming everyone. The millions of Baha’is in the world come from every ethnicity, nationality, tribe, age, racial group, religious background and economic and social class. Gentle, peaceful, warm and welcoming, diverse Baha’i communities exist just about everywhere. Baha’is accept the validity of each of the founders and prophets of the major world religions, and believe in progressive revelation, the unique Baha’i principle that views every great Faith as a link in a single spiritual system progressively revealed by God to humanity. The essence of Baha’u’llah’s Teaching is all-embracing love, for love includeth every excellence of humankind. It causeth every soul to go forward. It bestoweth on each one, for a heritage, immortal life. Erelong shalt thou bear witness that His celestial Teachings, the very glory of reality itself, shall light up the skies of the world. – Abdu’l-Baha, Selections from the Writings of Abdu’l-Baha, p. 66. Baha’is follow the teachings of Baha’u’llah, who proclaimed the Baha’i Faith during the middle of the 19th Century, and who taught world peace, the oneness of all humanity and the essential unity of all religions. Born Mirza Husayn Ali in Tehran, Persia in 1817, Baha’u’llah was known early in his adult life as “the father of the poor” for his selfless work assisting the destitute and homeless. In 1863, Baha’u’llah began openly teaching the Baha’i Faith, with its revolutionary messages of human unity, the oneness of all Faiths, the equality of men and women, the agreement of science and religion and the establishment of a global system of governance. …in the kingdoms of earth and heaven there must needs be manifested a Being, an Essence Who shall act as a Manifestation and Vehicle for the transmission of the grace of the Divinity Itself, the Sovereign Lord of all. Through the Teachings of this Day Star of Truth every man will advance and develop until he attaineth the station at which he can manifest all the potential forces with which his inmost true self hath been endowed. It is for this very purpose that in every age and dispensation the Prophets of God and His chosen Ones have appeared amongst men, and have evinced such power as is born of God and such might as only the Eternal can reveal. – Baha’u’llah, Gleanings from the Writings of Baha’u’llah, pp. 67-68. After the proclamation of his Faith, Baha’u’llah suffered forty years of exile, torture and imprisonment—all for announcing that a new revelation had been born. This great divine educator and messenger, despite the persecutions he bore, then wrote a series of epistles to the political and religious rulers of the world from his prison cell. Those letters, called the Tablets to the Kings, openly announced Baha’u’llah’s station and mission, and warned the world’s most prominent leaders that humanity faced disastrous consequences unless they laid down their weapons and convened to unite the world and end warfare. Baha’u’llah called the entire world to collective action and to unity, and that call, Baha’is believe, has inaugurated a new age of spirituality, harmony and human maturation. How Did Baha’i History Begin? In a troubled time and place—Shiraz, Persia in 1844—a young merchant and mystic named Siyyid Ali Muhammad made a startling announcement: that he brought the world a new message from God. Called The Bab (pronounced bob), which means “The Gate,” this new prophet created a furor in Persian society with his revolutionary teachings—spiritual and moral transformation, women’s emancipation and the raising up of the poor. The Bab also proclaimed that he had come to herald the birth of a new, universal revelation, one greater than his own, and to prepare the way for “He whom God shall make manifest”—the Promised One of all ages. The Babi Faith spread quickly, electrifying the masses and provoking severe reactions from the government and the clergy. Tens of thousands of Babis, including the Bab himself, were tortured, massacred and publicly executed for their beliefs. The inauguration of the Bab’s message and mission set Baha’i history in motion. After the Bab’s execution in 1850, Baha’u’llah gradually assumed the leadership of the Babis. 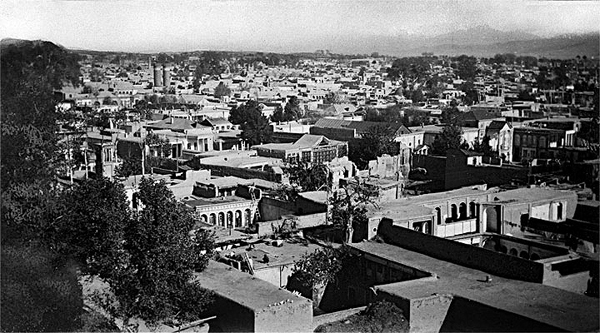 In prison in 1852, Baha’u’llah received the revelation that inspired the Baha’i Faith, and fulfilled the prophecies and promises of the Bab. The Baha’i Faith now counts millions of followers across every region, continent and nation of the world. Baha’u’llah’s teachings emphasize justice, equality and religious unity, so even today many Baha’is in Iran and other Middle Eastern countries still face persecution for their beliefs. Baha’u’llah suffered a life of torture and deprivation in order to bring the world a new set of spiritual teachings. Persecuted relentlessly, he still persevered in delivering that message, which has now begun to deeply affect and alter humanity’s future. The millions of Baha’is in the world come from every ethnicity, nationality, tribe, age, racial group, religious background and economic and social class. Gentle, peaceful, warm and welcoming, Baha’i communities exist just about everywhere. Baha’is accept the validity of each of the founders and prophets of the major world religions, and believe in progressive revelation, the unique Baha’i principle that views every great Faith as a link in a single spiritual system progressively revealed by God to humanity. Essentially a mystical Faith, the Baha’i teachings focus on the soul’s relationship with the eternal, unknowable essence of God, and recommend daily prayer and meditation to everyone. Baha’is believe that the human spirit lives eternally, and so endeavor to illumine their souls with spiritual attributes—kindness, generosity, integrity, truthfulness, humility and selfless service to others. 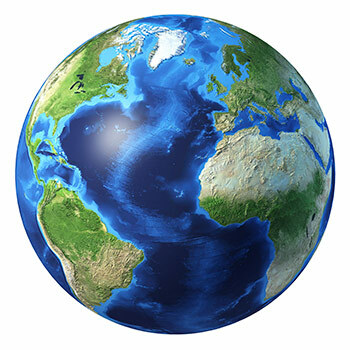 Also a practical Faith, the primary Baha’i principles advocate international unity, the complete cessation of all warfare, universal compulsory education for every child, a spiritual solution to the extremes of wealth and poverty, an end to religious fundamentalism and division, and a unified global response to oppression, materialism, and the planet’s mounting environmental crisis. Baha’is believe in the independent investigation of reality, and encourage everyone to question dogma, tradition and superstition by embarking on a personal search to discover the truth. The Baha’i Faith has no clergy. Instead, a distinctive system of democratically-elected councils at the local, national and international levels administer and guide Baha’i communities. This unprecedented administrative order, fundamentally different from any other system of religious or political authority, has now become the first functioning system of democratic global governance, vesting power and initiative in the entire body of the believers worldwide. The Baha’i writings say that religion must be the source of unity and fellowship in the world—but if it produces enmity, hatred and bigotry, the absence of religion would be preferable. The Revelation which, from time immemorial, hath been acclaimed as the Purpose and Promise of all the Prophets of God, and the most cherished Desire of His Messengers, hath now, by virtue of the pervasive Will of the Almighty and at His irresistible bidding, been revealed unto men. The advent of such a Revelation hath been heralded in all the sacred Scriptures… O ye lovers of the One true God! Strive, that ye may truly recognize and know Him, and observe befittingly His precepts. – Baha’u’llah, Gleanings from the Writings of Baha’u’llah, p. 5. O son of spirit! My first counsel is this: Possess a pure, kindly and radiant heart, that thine may be a sovereignty ancient, imperishable and everlasting. – Baha’u’llah, The Hidden Words, p. 3. Baha’is believe in one God, eternal in the past and the future, who loves and progressively educates humanity through successive revealed religions. The Baha’i writings say that the Creator is an “unknowable essence,” far beyond the capacity of creation to comprehend. To aid and enlighten us, God has provided humanity with divinely-inspired prophets and messengers throughout history, who founded the world’s great Faiths and brought ethical, moral and spiritual teachings to everyone. The Baha’i teachings center around unity, and Baha’is believe in the essential unity of all religions. Baha’u’llah emphasized the importance of unity, oneness and harmony in all human interactions, and said that the collective maturation of the human race has now brought us to the stage in our development where we can recognize our interdependence. 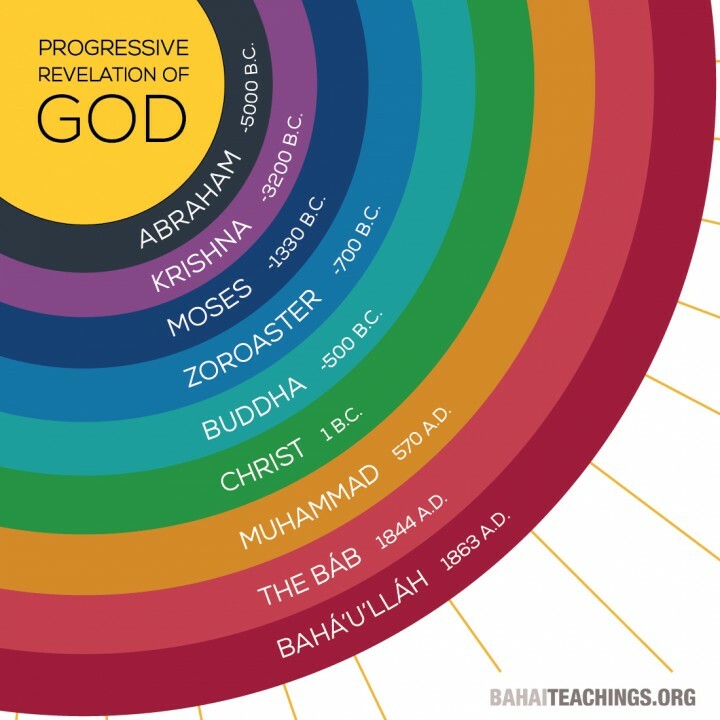 The successive prophets and messengers founded their Faiths at different times in history, and each of those religions, Baha’is believe, form part of one single meta-religion—a unified, systematic, progressive revelation, one school with many teachers. Baha’is accept, respect and revere the religions of Abraham, Moses, Krishna, Zoroaster, Buddha, Jesus Christ, Muhammad, and also the sacred traditions of the prophets and teachers of indigenous peoples whose names written history may never have recorded. The Baha’i Faith encompasses, embraces and advances the past teachings of all those great Faiths, and Baha’is view Baha’u’llah as the most recent of these divine teachers. Consider to what extent the love of God makes itself manifest. Among the signs of His love which appear in the world are the dawning-point of His Manifestations. What an infinite degree of love is reflected by the divine Manifestations toward mankind! For the sake of guiding the people they have willingly forfeited their lives to resuscitate human hearts. – Abdu’l-Baha, Foundations of World Unity, p. 89. Man has two powers; and his development, two aspects. One power is connected with the material world, and by it he is capable of material advancement. The other power is spiritual, and through its development his inner, potential nature is awakened. These powers are like two wings. Both must be developed, for flight is impossible with one wing… We must strive unceasingly and without rest to accomplish the development of the spiritual nature in man, and endeavor with tireless energy to advance humanity toward the nobility of its true and intended station. – Abdu’l-Baha, The Promulgation of Universal Peace, p. 59. Our inborn spiritual nature can create a mystical relationship with the Creator, giving meaning and purpose to our lives. The Baha’i teachings say that process happens through meditation and prayer, the inner growth driven by our spiritual search for truth, the love we give to others, and ultimately as a result of our selfless actions to serve humanity. God’s purpose in sending His Prophets unto men is twofold. The first is to liberate the children of men from the darkness of ignorance, and guide them to the light of true understanding. The second is to ensure the peace and tranquility of mankind, and provide all the means by which they can be established. – Baha’u’llah, Gleanings from the Writings of Baha’u’llah, p. 79. These fundamental Baha’i principles call for a complete restructuring of humanity’s priorities—from material to spiritual, from exclusive to inclusive and from divisiveness to unity. You can find Baha’is just about any place you look—but you will probably need to look. Discover for yourselves the reality of things, and strive to assimilate the methods by which noble-mindedness and glory are attained among the nations and people of the world. No man should follow blindly his ancestors and forefathers. Nay, each must see with his own eyes, hear with his own ears and investigate independently in order that he may find the truth. – Abdu’l-Baha, Divine Philosophy, p. 24. Baha’is eagerly welcome anyone on a path of spiritual search—or anyone who would like to learn more about the Baha’i Faith. Many Baha’i communities around the world have informal meetings where seekers can examine and explore the teachings of this new Faith. Called “firesides” or study classes, those Baha’i meetings encourage questions and open-minded discussion about life. Everyone is welcome. …one of the most vital institutions in the world, and it hath many subsidiary branches. Although it is a House of Worship, it is also connected with a hospital, a drug dispensary, a traveller’s hospice, a school for orphans, and a university for advanced studies. – Abdu’l-Baha, Selections from the Writings of Abdu’l-Baha, pp. 99-100. 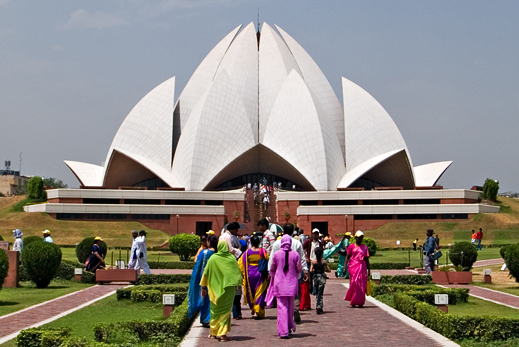 Many of these temples (like the Baha’i Lotus Temple in India, pictured) have become magnets for those from every Faith and no Faith, as a place to reflect, meditate and pray, and as beautiful monuments to the Baha’i ideals of the oneness of God, religion and humanity. Most new world religions bring a new calendar—and the Baha’i Faith does, too. Year one in the Baha’i calendar began in 1844, when the Baha’i Faith began with the announcement of the Bab’s revelation. 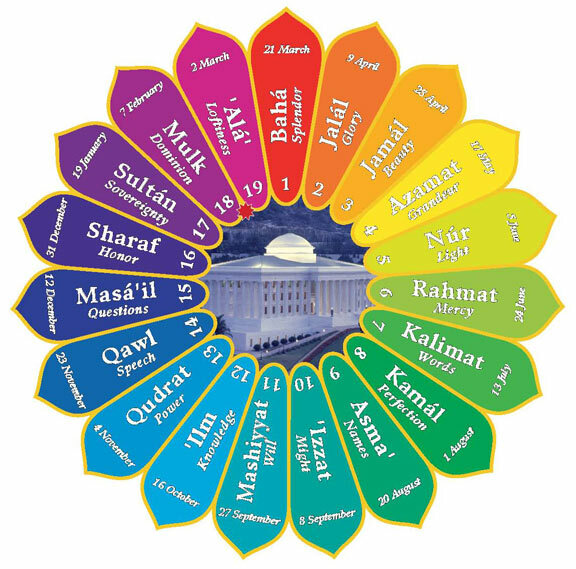 The Baha’i calendar, originally initiated by the Bab, bases its unique structure on the number 19. Called the Badi Calendar, meaning wondrous, it equalizes the length of every month and also accounts for variances in the Earth’s orbit around the sun—unlike any other calendar in use today. Composed of nineteen months of nineteen days each, each Baha’i calendar year begins in spring on the Vernal Equinox, on the day of the ancient Persian New Year known as Naw-Ruz. With 19 months of 19 days each, the Baha’i calendar adds four (or in leap years, five) Intercalary Days to make up a full solar year of 365¼ days. Baha’is set aside those Intercalary Days for celebrations, hospitality, gift-giving and charitable works. The Intercalary Days immediately precede the final 19-day Baha’i month, when Baha’is fast during daylight hours. Intended as a reflective period of prayer and meditation, the Baha’i Fast symbolizes detachment from the material world, and utilizes the final 19 days of the year for revitalizing the inner spiritual life of each adult Baha’i. The International Baha’i Centre, located in Haifa, Israel, now also attracts people from all over the world, not only as holy places of pilgrimage for Baha’is but as tourist destinations known for their serenity and delightful majesty. The Baha’i shrines and buildings on Mt. 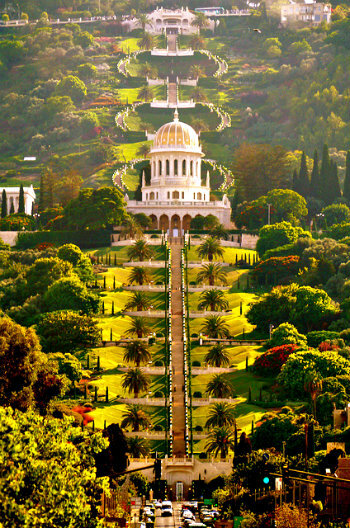 Carmel in Haifa, for example, have become known as the Baha’i Gardens, because of their extensive terraces, flowering gardens and the golden dome of the Shrine of the Bab, a landmark in northern Israel and a beacon of peace and hope worldwide. The International Baha’i Centre also houses the Seat of the Universal House of Justice, the democratically-elected administrative leadership body of the global Baha’i community. Baha’is love beauty, as you’ll see if you visit the International Baha’i Centre or any of the world’s Baha’i Houses of Worship. Surrounded by beautiful gardens and fragrant flowers, illumined by creative, light-filled architecture and suffused with the peace and serenity of a truly spiritual atmosphere, these places host millions of visitors every year, silently proclaiming the peace and unity Baha’u’llah taught and the Baha’is work to achieve. Anyone can become a Baha’i. Becoming a Baha’i means accepting Baha’u’llah’s unifying teachings, and deciding to try to follow the path of spiritual development the Baha’i teachings outline. There is no service, baptism or ceremony involved—becoming a Baha’i simply requires an inner, spiritual decision to embrace the teachings of the Faith and join your local Baha’i community. In many countries, Baha’is also sign a declaration card, which enrolls them in the Baha’i community and allows them to receive invitations to community events and gatherings. When you make the decision to become a Baha’i, you also take part in a planetary movement to change the world. Baha’is work for peace, justice, equality, racial unity and environmental sustainability—all based on addressing the underlying, spiritual causes of such inequities. The new, optimistic model the Baha’i teachings offer the world takes a fresh approach to problem-solving, tapping into the deep well of human concern for others with a thoughtful, integrated and comprehensive spiritual energy. Becoming a Baha’i makes you a world citizen, a part of the world’s newest major Faith and an immediate member of a loving, inclusive global community of truly remarkable souls. Baha’i events—meetings, elections, parties, devotionals, holy day celebrations, a Baha’i “Feast” at the beginning of every month (the feast is a community gathering that usually includes prayers and readings from the Baha’i writings, a period of community consultation and refreshments)—tend to include lots of social interaction, with laughter, music and a general sense of joy and happiness. Depending on their size, Baha’i communities often meet in homes, local Baha’i centers or meeting rooms. Diverse and inclusive, most Baha’i meetings give participants the opportunity to meet and get to know people from different backgrounds, cultures and nations. Baha’is never ask others for monetary contributions—in fact, only Baha’is can contribute to the Baha’i funds, and all contributions are completely confidential. No one ever passes a plate or requires anyone to participate, since every donation is considered private and personal. To be a Baha’i simply means to love all the world; to love humanity and try to serve it; to work for universal peace and universal brotherhood.” – Baha’u’llah and the New Era, p. 83. If you’d like to meet Baha’is in your local area, they’re usually listed online, in a local newspaper or phone book, or in directories of places of worship. If you can’t find any local Baha’is, feel free to email us here at support@BahaiTeachings.org, and we’ll be happy to put you in touch with a nearby Baha’i community.